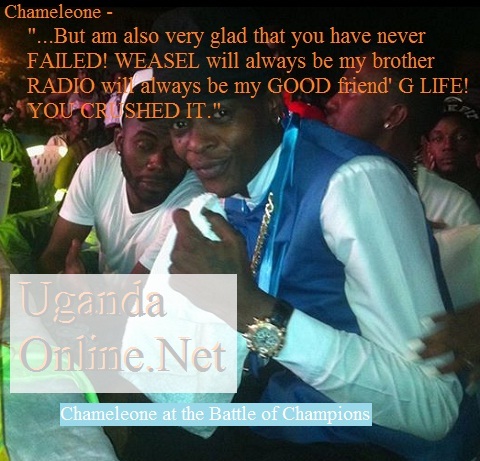 At the Battle of Champions on Friday night, Jose Chameleone amused a host of music lovers when he attended the show, though what left a lot to be desired were his words: "Even when you fail, you are a winner to me, but I’m also very glad that you’ve never failed!" Quite interesting and confusing at the same time but trust the music Doctor, he will always come out as a winner. The mere fact that he attended their show, (Bebe Cool, Moze Radio and Weasel) and yet they have always had issues with him in the recent past just puts him at another level. They are not on talking terms with his young brother, Weasel for years since splitting from the Leone Island Crew and not even the several family meetings have been able to sort this out, just recently, Bebe Cool was on his case for having shifted to his in-laws after quitting his Muyenga pad for reasons best known to him. When it comes to Moze Radio, they even have serious issues as seen from the way Moze was so bitter with the Uganda police for having taken long in investigating the Karamagi case. The ‘Tubonge’ singer who will be performing live on the Christmas Eve in Mwanza at CCM Kirumba Stadium revealed how close he was to the dynamic duo; "Weasel will always be my brother as Radio will always be my good friend, Goodlyfe you crushed it,” as he concluded." Meanwhile, much as he was for the Goodlyfe during the Battle, he occasionally danced to some of Bebe Cool's music.